There are (at least) six artists who go by the name Lucia. 1. Lucia (not pictured on this site) is a psychedelic indie singer-songwriter from Miami, FL. Her album Studio 71 was released in 2009 and features the hit single "A Little More Time," which has been featured in commercials. She met producer Bobby MacIntyre at a songwriter showcase and teamed up to work on her full length debut. The album also features Scott Bennett, Shane Soloski, Rafael Tarrago, Adam Zimmon, Aaron Fishbein, Demetrius Brown, Ben Peeler, and Joe Rehmer. 1. Lucia (not pictured on this site) is a psychedelic indie singer-songwriter from Miami, FL. Her album Studio 71 was released in 2009 and features the hit single "A Little More Time," which has been featured in commercials. She met producer Bobby MacIntyre at a songwriter showcase and teamed up to work on her full length debut. The album also features Scott Bennett, Shane Soloski, Rafael Tarrago, Adam Zimmon, Aaron Fishbein, Demetrius Brown, Ben Peeler, and Joe Rehmer. 2. 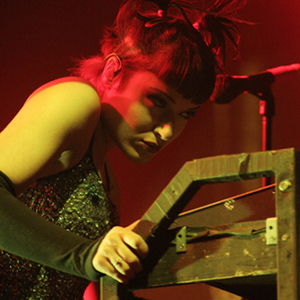 Lucia Cifarelli (pictured) is currently a vocalist for the industrial music group KMFDM. She has previously been a member of the bands MDFMK and Drill. She performed on Drill's self-titled release Drill, the MDFMK album, MDFMK as well as the KMFDM albums Attak, WWIII, Hau Ruck, Tohuvabohu, Blitz, and WTF?!. She also has a solo release called From the Land of Volcanos under the moniker "Lucia". In January of 2006 Lucia was featured in the magazine Revolver as one of the hottest women in contemporary music. In July 2005 she married bandmate, Sascha Konietzko. 3. Lucia is a Spanish singer, who represented Spain in 1982 at the Eurovision Song Contest with the song ?l. 4. Lucia was formed by Eric Frank, Darrin Kemp, Chris Nix, and Damien Kuntz. They played many many practices but only performed one show with Drowning with Our Anchors. It's over now. 5. Lucia (real name: ?? ?, Shim Kyu Seon) is a Korean indie musician signed under PASTEL MUSIC. 6. Lucia Maria Popescu, better known by her first name, is a Romanian 17 year old singer. Her first single "Silence" was officially released in February 2012 and has at once become one of most listened songs from Radio Guerrilla. Her vibrant, delicate voice has touched a deep chord in not only in Romanians' hearts but also around the world.